Paying off your debt can sometimes feel like fighting a losing battle against an enormous monster. It’s tiring. And you can easily get bogged down by focusing on your total debt amount. In reality, you win the fight by chipping away at the debt here and there in small pieces, much like a sculptor turns an ugly block of rock into a beautiful model. But, we know, when you’re in the midst of the fight, that part is hard to see. Instead, try a new mind hack: find a way to physically see the chips and cracks you’re making in your debt. Here are a few ideas. 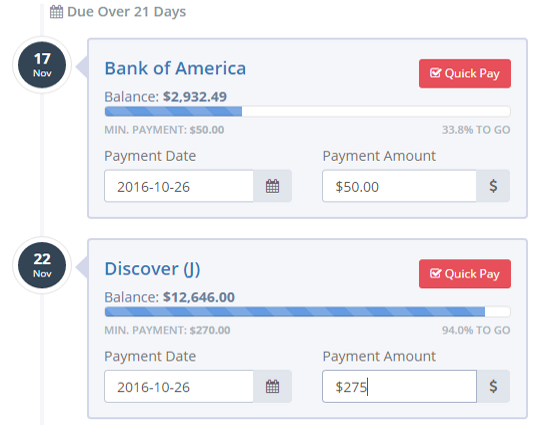 Undebt.it is a free web-based program that lets you enter your debt and relevant details (interest rate, how much you owe, etc…) for a snapshot view of your situation. What’s more, you can use it to plan out a specific plan of attack using the Debt Snowball method. You can even see how long before you’re out of debt and how much interest you’ll pay. Another nice feature? You can see the effect of making extra payments towards your debt each month. If you’re not comfortable putting your personal financial details on the internet, or if you just prefer to keep your numbers in-house, no problem. Track your debt-payoff progress with an Excel spreadsheet or Google Sheets. Simply create three columns: your debt’s name, how much you originally owed and how much you owe now. Tally the number up at the bottom. Then, divide the Total Amount Originally Owed by the Total Amount Owed Now to see exactly where you are in your debt-payoff journey. Each month, as you make your debt payments, update this spreadsheet to see where you currently stand. It’s time to get out your elementary-school art supplies! Break down your debt into manageable chunks—$50, $100, or $1,000. For each debt chunk, make a link in a paper chain. Whenever you pay off a certain chunk of debt, tear off a link at the end of the chain. Over time, you’re chain will get shorter, and your debt will get smaller. Pay it off to tear it off. Yes, this one is motivating and fun! Do you know why charities and schools love drawing fundraising thermometers? Because tracking a campaign’s financial progress that way is great motivation! You can use the same concept, except you’ll be tracking your way to your own debt Freedom. Buy a cheap poster board from a craft store. Then, outline a thermometer in pencil. When you’re happy with the layout, finalize with a black marker. Keep a red marker nearby, and fill your thermometer in as you make progress towards paying off your debt for good. Maybe hanging up a paper chain link or a giant thermometer drawing inside your home for all to see isn’t exactly your thing. That’s ok. Instead, find a budget-friendly way to celebrate when you reach pre-determined milestones. An activity as simple as renting a movie or going out to a tasty fast-casual restaurant is all you need. But decide beforehand when you’ll celebrate. When you pay off $500 in debt? $1,000? Otherwise, your regular monthly payment could quickly turn into an unnecessary (and budget-busting) series of celebrations. The sky’s the limit! These are only a few ideas you might use to track your debt progress. It doesn’t matter how you do it, just do it! That way, your small wins feel more real, and you avoid the temptation of giving up because you don’t “see” your progress. Stay motivated, and you’ll be debt free before you know it.